Search real estate listings to find homes for sale and apartments for rent on Zillow. Buy homes, rent apartments and sell real estate in your local area. Explore open house, foreclosure and new construction listings. 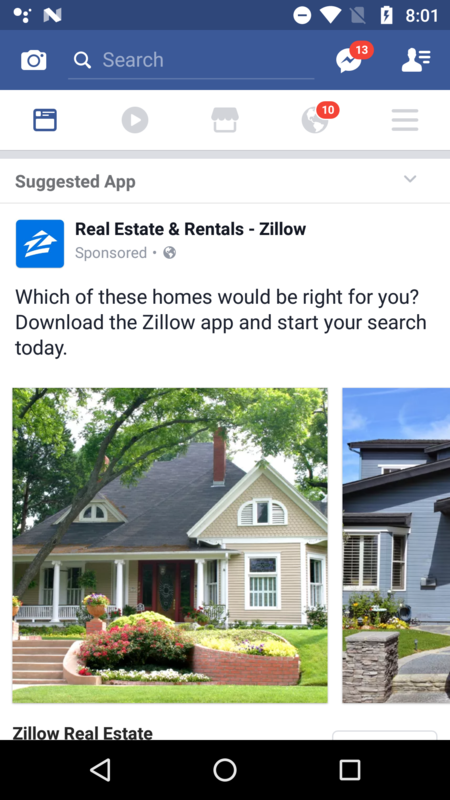 Compare prices on rentals, connect with agents, get home values and stay on top of the property market.Buy homes, rent apartments or sell real estate with Zillow: TOP 3 FEATURES1. Search 100 million+ real estate listings to find houses for sale and apartments for rent in any neighborhood or at any address nationwide.2. Stay informed about open house and MLS listings in your local area. Talk to agents, get mortgage information and receive property alerts. Buy homes or rent apartments at the price that works for your budget.3. Compare values on home listings in your neighborhood and get a Zestimate® for your property today.Zillow is the easiest way to find houses for sale and apartments for rent. Get home values, details on rentals and foreclosures you won’t find on the MLS. Buy homes by the beach, search property in the city center or find a neighborhood with great schools nearby. Look for a place for your life to happen® with Zillow.Search and compare prices on property and rentals. Get all the details you need.• Find properties in your local area by using your device’s location, typing in an address or drawing a custom region on the map.• See information on schools in the neighborhood plus nearby amenities, including restaurants, grocery stores, parks and coffee shops.Stay on top of the real estate market.• Get notified when new real estate listings hit the market, are sold or drop in price. Save your favorite properties and be the first to know if information changes.• Enjoy free, exclusive access to foreclosure listings in your local area, including pre-foreclosures, foreclosure auctions and bank-owned properties.Want to buy homes or sell real estate? Discover home values and financial resources to help make your purchase happen.• Access mortgage calculators, real-time mortgage rates and customized loan quotes.• Find a local lender who can pre-qualify you for a mortgage.Unsure about your next move? Connect with a real estate professional.• Speak with a real estate agent in your local area who can guide you through the buying and selling process.• Create a Renter Profile to attend an open house and engage directly with potential landlords and property managers.Zillow is for those who want to be empowered in their real estate search. With access to millions of listings of every kind across the U.S. and resources you won't find on the MLS, you'll be on top of your house hunt. Zillow provides guidance every step of the way so you can focus on living the moments that matter in your new home.